If you have not heard about the GoBoard, it comes in many different variations around the world. The Patgear, or Egret One was a derivation of the original GoBoard. 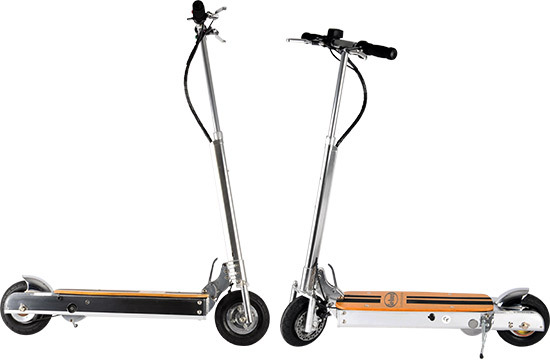 The original of course belongs to the Roth Go Motorboard which was invented by David Roth who held the patent for the first portable motorised kick scooter. All subsequent designs of the motorboard or GoBoard variations are descendants of the Roth Go MotorBoard. The original is no longer in production sadly as it encountered many reliability problems and hence, customers got disillusioned with the brand and abandoned it. However, today, the modern version of the Roth Board has made a comeback as the GoBoard. With a new integrated hub motor, and an elongated deck (97cm) to give riders more leg room, the GoBoard is genuinely a real contender with the Patgear or Egret One, or the many other OEM iterations you can find in the market. Slightly less heavy than the Patgear/Egret One, the GoBoard weighs in at 13kg with similar power specs but with a larger battery size (9Ah vs Patgear’s 8Ah) and a similar motor size. However, the one advantage the GoBoard has over the Patgear other than the lighter weight is that 8 inch inflatable tires. For some reason, Patgear stil insists on using hard rubberized wheels with shock absorbers. This not only adds weight but gives a poor ride feel in the long run. You won’t feel it for 1 km or so, but if you are going more than 5km, your body will be taking a lot of stress from the road. The GoBoard is now available at Falcon PEV at a discounted promotional price. Check out www.sgelectricscooters.com or www.facebook.com/falconpev for more details. Stop by the Falcon’s showroom for a test drive!